The Colorado Juvenile Justice System and Juvenile Parole – After serving a sentence in the equivalent of juvenile prison – the Division Of Youth Corrections (DYC) a juvenile is place on parole. This article addresses the terms and conditions of parole and the matter of parole violations. Juvenile detention facilities are used to house juveniles who have been charged but not adjudicated yet. 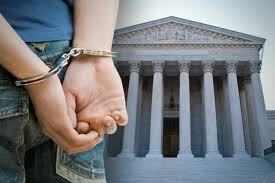 If a juvenile is being “detained” awaiting trial – they are jailed in one of several facilities. If a judge sentences a juvenile to the DYC – the first stop is one of four regional assessment centers. Once at the center a full assessment using tools developed to measure risk is used to determine the youth needs. The assessment takes place in al locked detention center and takes about 30 days. The intent of the assessment is to place the juvenile in a DYC facility and to develop a treatment plan. After adjudication and following sentencing the DYC places the juvenile in a juvenile state prison for the amount of time ordered by the judge. The majority of the sentences to DYC are for two years but juveniles adjudicated as “Aggravated Juvenile Offenders” can be sentenced to up to seven years, and may thereafter be transferred to the Colorado (Adult) Department of Corrections after the age of 18. Juveniles who are 10 to 20 years old may be committed to DYC for acts committed prior to the child’s 18th birthday. But, if at the time of sentencing, a juvenile has reached the age of 19, the juvenile can be sentenced to a county jail or to community corrections program. After the age of 21 – the Division on Youth Corrections loses jurisdiction of the juvenile and must be released or transferred to an adult prison. and Zebulon Pike Youth Services Center (Colorado Springs) ALL house committed youth. and the Ridge View Youth Services Center (Watkins) are state-owned, privately operated facilities that also house committed youth. * Some of these facilities also are used as temporary detention jails. At the end of the commitment to DYC – there is a mandatory six-month period of parole. The Colorado Juvenile Parole Board has the authority to extend parole by an additional 15 months if they deem it necessary. The parole officer is same Client Manager that was the juveniles closest contact while in the system. If the juvenile abides by the rules for the six-month parole period, he/she is discharged from the custody and the supervision of DYS and the case is closed. If – on the other hand – the juvenile fails to comply with the rules and regulations of parole – parole may be revoked, and the juvenile returned to the juvenile locked facility. If you are charged with A Colorado crime or you have questions about The Colorado Juvenile Justice System and Juvenile, please call our office. The Law Offices of H. Michael Steinberg, in Denver, Colorado, provide criminal defense clients with effective, efficient, intelligent and strong legal advocacy. We can educate you and help you navigate the stressful and complex legal process related to your criminal defense issue. Colorado Defense Lawyer H. Michael Steinberg provides solid criminal defense for clients throughout the Front Range of Colorado – including the City and County courts of Adams County, Arapahoe County, City and County of Boulder, City and County of Broomfield, City and County of Denver, Douglas County, El Paso County – Colorado Springs, Gilpin County, Jefferson County, Larimer County, and Weld County,…. and all the other cities and counties of Colorado along the I-25 Corridor… on cases involving …The Colorado Juvenile Justice System and Juvenile.